National deputy of Ukraine, head of the Verkhovna Rada Committee on Industrial Policy and Entrepreneurship. For years of work Victor performed a wonderful career. In 1998 he began working as an intern in the audit firm “COWPERWOOD” (Dnepropetrovsk). In the period from 2005 to 2009 taught in the National Mining University (Dnepropetrovsk). Since 2007 – the head of the Commission for the evaluation of investment projects of the USFA, and since 2011 – the member o the Executive Committee of the USFA. In 2008-2009 – the member of the Board of Dnepropetrovsk branch of the European Business Association, since 2011 – the member of the Public Council under the Ministry of Finance of Ukraine. In 2012 he headed the Company “Bionic Hill” – a management company of BIONIC Hill. In August of 2014 he became an adviser on economic issues to the leader of Radical party Oleg Lyashko, subsequently was elected as a national deputy of Ukraine on the list of Radical party. In December of 2014 by the decision of Verkhovna Rada he was appointed as Head of the Verkhovna Rada Committee on Industrial Policy and Entrepreneurship. Victor taught at several universities, including at the NBU University of banking business, performed economic lectures abroad. Alexander heads an analytical department of ICU. His main focus is macroeconomic analytics, bonds and foreign exchange markets. He began his career in the financial market in 1995 in Prominvestbank. Further, since 2000, Alexander’s career was devoted to the analytics in the securities market and macroeconomic situation, namely in the investment company ART-Capital (2000-2003) and Ukrsotsbank (2003-2005). Prior to joining the ICU he headed analytical department at ING Bank Ukraine (2005-2008). In 1994 he graduated from the Vinnitsa Polytechnic Institute. In 1999 – MAUP (Kiev). Since 1992 he held executive positions in the commercial bank and non-banking financial institutions, in the stock market, state enterprises in the financial sector, head of the department at the State Commission on Securities and Stock Market, at the Presidential Administration. From 1997 to 1998 he took part in creating the service of investigation of violations in the stock market of the State Commission on Securities and Stock Market. In 1998-1999 he participated in the creation of the National Depository of Ukraine. In 2000-2003 he passed foreign internship on programs of the Institute on preparing senior management personnel of the Ukrainian Academy of Public Administration under the President of Ukraine on state economic policy and social partnership (Presidential Administration and the Cabinet of Ministers of Estonia, Tallinn; Higher School of Public Administration in the city of Lodz (Poland)). As a consultant he participated in the development of projects to attract investments in the infrastructures of Kiev, Chernigov, Dnepropetrovsk. Speaker at international conferences and seminars in the cities – Kiev, Dnepropetrovsk, Odessa, Kharkov, Tallinn (Estonia), Lodz (Poland) in 2000-2011. Expert on issues of private pension provision. He actively participates in the development of the private pension provision system in Ukraine. In 2004-2011 he headed the asset management company-administrator pf NPFs and the Councils of the largest pension funds in Ukraine, including NPF “EUROPA” and NPF “UKRSOTSFOND”. From 2011 to the present day he is one of the heads of the Insurance company “Ukrainian reserves”. 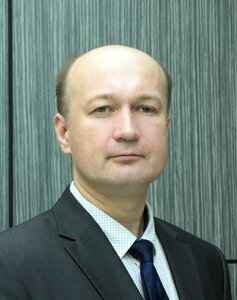 Co-writer and author of publications on economic issues in the magazines “Companion”, “Ukraine Business Review”, “Management of the modern city”, “Banking Auditor”. Author of numerous scientific publications on issues of economic policy. Co-author of the article in “The Encyclopedia of Banking Business” (NBU, 2001), 3 economic textbooks for students in attracting investments in the infrastructure of cities. USFA member since 1998. Chairman of the Board of the investment company “Ukrainian securities”. He graduated from the Kiev State University, specialty “Geophysics”. He worked at the Institute of Geophysics of the Ukrainian Academy of Sciences. Postgraduate study at the Research Center of scientific and technical potential and history of science, at the Ukrainian Academy of Sciences. Candidate of Economic Sciences. In 1994 he founded “Ukrainian securities”, first – as a consulting firm. He has work experience as appraiser and consultant, broker at USE and PFTS. He headed the management of securities at “Gradobank”. During the “great” privatization he worked as an investment fund manager. Attorney-at-Law, Senior manager of KPMG in Ukraine. In 1990–1995 attended the Kyiv State Economic University (KNEU named after Vadym Hetman), where he studied International Economics graduating with a specialization in Accounting and Audit of Foreign Economic Affairs. In 2002–2007 attended Yaroslav the Wise National Law Academy, where he studied Law Science graduating with a specialization in Business Law. In 1993, he studied working at SE “Budtechs”, where he was given responsibility to assist the Chief Accountant in day-to-day activities, later becoming the translator and economist on the staff of the Banking Correspondent Department of JSB “Brokbusinessbank”. In 1995, he was appointed to the staff of Deloitte in Ukraine as the audit assistant and later on as the tax consultant. In 1999, he moved to Dnipropetrovsk (Dnipro), where he worked as the tax manager of JSC “DOEP” (TM ‘Oleina’) and he was given the responsibility for tax affairs of Bunge group of companies in Ukraine. In 2008, he returned back to Kyiv to serve as senior lawyer and later on as attorney-at-law with Baker McKenzie, GLN (Gide), and Paritet Law Firm. In 2013 and through 2016, he was an independent attorney-at-law. In October 2016 he joined KPMG in Ukraine, where he was appointed as senior manager of Tax & Legal and is in charge for the indirect taxation, foreign trade and customs. In 1996 and 1998, he passed the professional exams and through 2006, he was the Certified Auditor of Ukraine for companies, not-for-profit organizations, banks and non-banking financial institutions (the Certificates series ‘A’ and ‘B’). In 2000 through 2007, he was elected the member of Audit Committee of Ukroliyaprom Association. In 1998 through 2006, he served as assistant to the People’s Deputy of Ukraine, later on as the consultant to the Verkhovna Rada Committee on Industrial Policy and Entrepreneurship. In 1999, he was appointed as the member of the Accounting Board of Ukraine with the Ministry of Finance of Ukraine, in 2009 and through 2011, he became the member of Public and Expert Councils of the Ministry of Finance of Ukraine. In 1998 and through 2009, he was elected the secretary and later on the chairman of the Tax Committee of the European Business Association in Ukraine. In 2016, he became the member of the Tax Committee of the Ukrainian Chamber of Commerce and Industry and he was appointed the member of the International Economic Cooperation Council with the Ukrainian Chamber of Commerce and Industry. In 2017, he was elected the co-chair of the Tax Committee of the American Chamber of Commerce in Ukraine. In 2011, he was qualified to the Ukrainian Bar and since then is the member of the National Association of Attorneys of Ukraine, the member of Kyiv City Bar. Taras is the member of the USFA since 1998, he was elected as the Executive Committee member in 2000 and served until 2012, he was re-elected again in 2019, he served as the chairman of the Financial Accounting Commission until 2012 and he was the member of the European Federation Financial Analysts Societies FAC from 1999 until 2012.